Transform salvaged light fixtures into classy, funky, or whimsical semi-enclosed gardens during The RE Store's Creative Terrariums Workshop. Design professionals and horticulturists from Exteriorscapes will explain how to design, create, and care for your very own terrarium. Participants choose from a selection of glass light fixtures; plants and substrate are provided. Bring small figurines, pebbles, shells, twigs, or other tiny decor to personalize your creation. Children ages eight and older are welcomed to attend with adult supervision. Refreshments provided. $15 materials cost. The Coalition of Organic Landscape Professionals (COOL) and Seattle Tilth are proud to present the NW Premiere of the documentary film, 'A Chemical Reaction'. Much of the film’s story focuses on Dr. June Irwin, a dermatologist who spurred the first town in Canada to ban lawn and garden chemicals pesticides in 1991. This action set off a chain of high-profile court cases that culminated in the Canadian Supreme Court in 2001, where the town won in a landmark 9-0 decision. 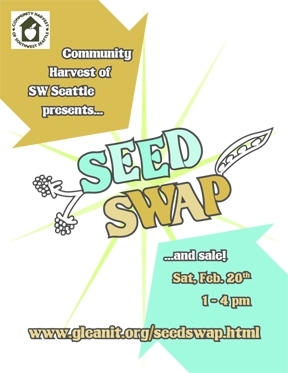 Community Harvest's 1st Annual Seed Swap and Sale! Want to save money on seeds this year? Try some interesting varieties without buying full packets. Avoid ending up with left-over seeds at the end of the season. We have ordered seeds in bulk from Territorial, Seed Savers, and Fedco and will be splitting them into mini-packets, the right size for the home gardener. Have a look at our seed list.